Showing 54 articles from October 9, 2013. LOUISBURG — Franklin County commissioners agreed to move forward with a plan that could put officers in all of the county’s schools although some of them would be there only part-time on a rotating schedule.. 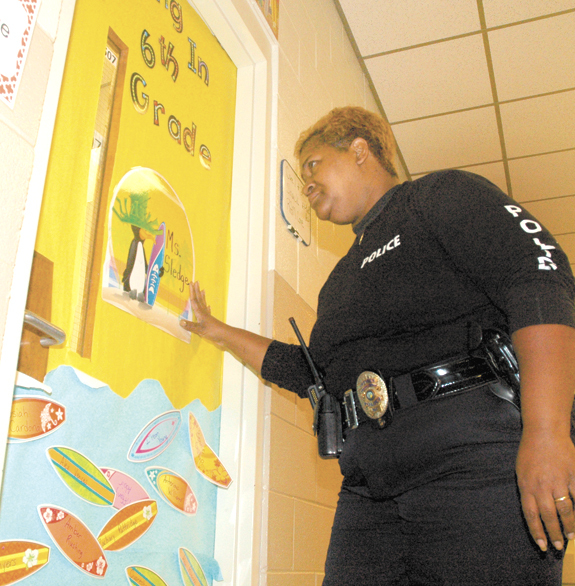 The General Assembly approved $10 million each for the next two fiscal years, giving school systems across the state a chance to apply for a grant to pay for school resource officers during that period. LOUISBURG — Following a closed session, Franklin County commissioners gave their attorney permission to resolve an animal welfare issue that threatens to close its animal shelter. On Sept. 24, the director of the state’s Animal Welfare Division notified Franklin County that it had suspended the county’s animal shelter registration and assessed a $5,000 penalty — punishment for Animal Control Director Taylor Bartholomew violating the Animal Welfare Act by euthanizing a dog on the premises with a rifle. 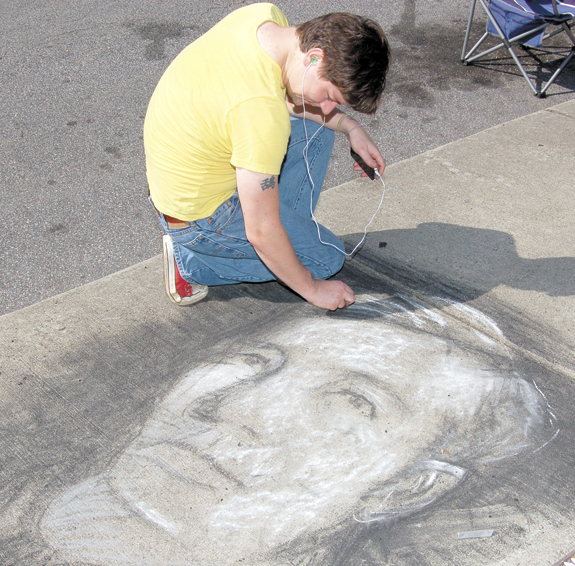 Pat Noles uses chalk and other tools to render a picture of Gov. Thomas Walter Bickett, who, at one time, represented Franklin County in the General Assembly. Noles won first place in the children’s division. 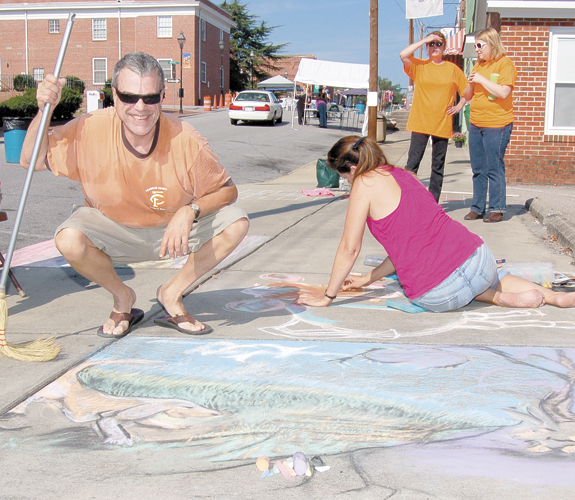 This past Saturday’s art display was part of an Art in the Street event hosted by the Franklin County Arts Council. The event featured both artists and musicians. LOUISBURG — The race for November has finally gotten into the hands of voters, as they could begin requesting absentee ballots on Monday. Early voting begins next week for the Nov. 5 municipal elections. This past Monday, any of the county’s just more than 39,600 registered voters could begin requesting an absentee ballot — either by mail, email or by walking into the elections office on Industry Drive. Louisburg College has been awarded a $2.2 million Title III grant from the U. S. Department of Education. The announcement was made by U.S. Rep. G. K. Butterfield, D-1, who said the grant will be used to strengthen its academic curriculum, improve student support services, and upgrade its technology and infrastructure. The grant is part of the Strengthening Institutions Program. 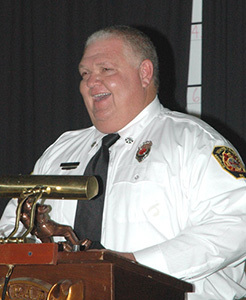 The Franklin County Firefighters Association elected new officers during its annual banquet the evening of Oct. 1 at the Louisburg Moose Lodge. 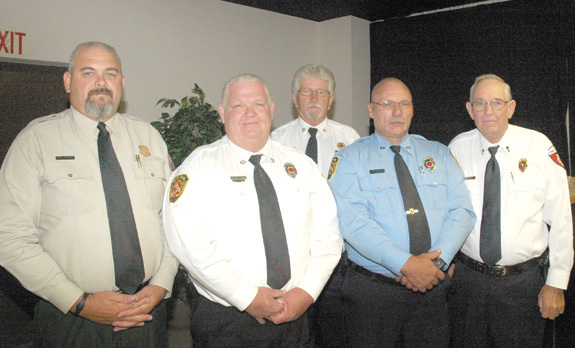 Firefighters elected Lee Gupton, second from right, as their new president. Sometimes the exception makes the rule — and the “rule” that Mondays are always a drag evaporated easily this week. That happened, not because we finally started getting some much-needed rainfall, but because a bit of Franklin County history was saved and because I met some enthusiastic, positive-thinking people who aren’t letting the days’ political shenanigans get them down. Although it has become downright sporting to make fun of some of the decisions emanating from Raleigh over the last several years — in administrations from both parties, by the way! 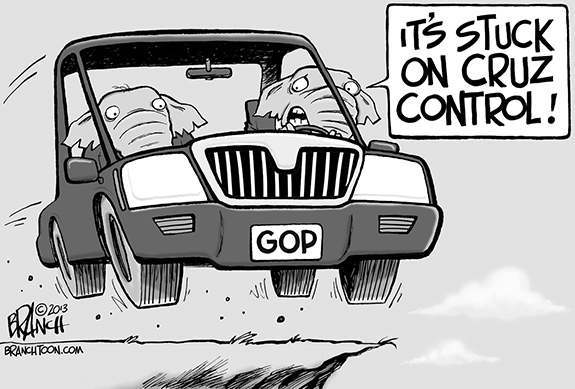 — you have to admit that one recent decision perfectly defines government stupidity. How else can you describe a threat from the state’s Department of Agriculture to close the Franklin County Animal Shelter after one alleged violation by one person happening one time in extenuating circumstances? I figure I may make some people mad. Oh well. I’ve read and seen reports about how the Raleigh Police Department used plain-clothes, undercover officers to conduct surveillance during meetings used to organize the Moral Monday protests. Organizers are upset that the police department would use such covert tactics to infiltrate the meetings and gather intel. Some mornings just start out more promising than others. Friday was one of those mornings. One of the first things to come to my attention was a picture of Republican George Holding asleep in the Speaker’s Chair while presiding over the House of Representatives. My first reaction was: if this is true it will make for a great article. My cautious side took over and I thought even Holding couldn’t be that stupid; the picture must be photoshopped. Well, here you go, the story of the chicken dance. A few weeks ago, I was at a Franklin County Board of Commissioners meeting and I committed the sin of not making sure my cell phone was off. Anyone that has ever been somewhere when a cell phone rings during a meeting thinks how inconsiderate the violator was of others. It would have only taken the person a few seconds to turn it off. Why didn’t they just do it? I have interacted with Animal Control Director Taylor Bartholomew on several occasions. He impressed me as an intelligent, straightforward and honorable young man. He used common sense and extraordinarily good judgment in his handling of a very difficult situation. Oct. 3, Petera posted the following question as part of an online comment: Don’t we agree that members of the Senate should be elected by popular vote? This is a great question and I am glad it was asked. No matter what poll is taken, Congress gets an approval rating of 10-12 percent, because they get little or nothing accomplished. RALEIGH - John Arthur McKay of Bent Green St,, Raleigh, died on Tuesday, October 1, at Hospice of Wake County at the age of 77. Over the course of his life, John valued family, the challenges of ever-changing technology, writing, music, traveling and cooking for others. CONOVER, NC - Virginia A. Suarez “Ginny” Bunn, age 80, of Conover, NC, passed away Saturday, September 28, 2013, at her residence after a long, valiant fight with Alzheimer’s and Parkinson’s disease. Virginia was born on December 6, 1932, in Brooklyn, NY. She was the daughter of the late Raymond and Sylvia Fabricant Suarez. Raised by Raymond and the late Emily McVicar Suarez. THAT DIDN’T TAKE LONG. 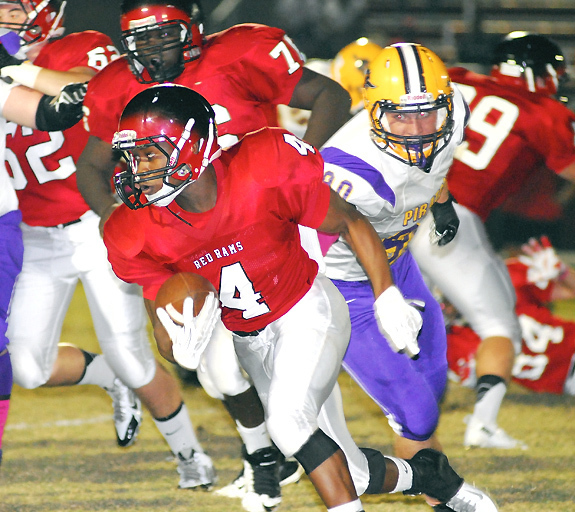 Franklinton’s Travon Judkins breaks free during a long touchdown run on the third play of the game of the Red Rams’ home football matchup last Friday night against non-conference opponent Corinth Holders. After a seemingly never-ending series of momentum swings and big plays on both sides of the ball, Franklinton’s home contest last Friday against Corinth Holders was destined to come down to one play. After scoring with just over one minute left to draw to within one point, the Red Rams opted to go for a potential game-winning two-point conversion. A FOUL FEELING. 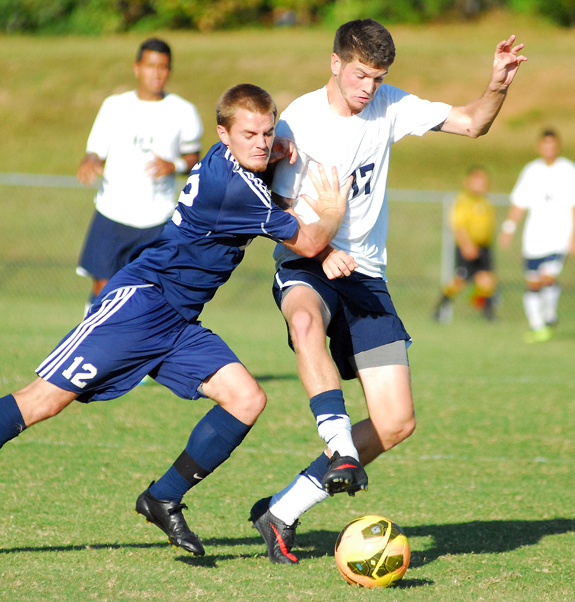 Louisburg College’s Zach Shriver (right) is fouled near the midfield during last Wednesday’s home soccer matchup against Region X foe Cape Fear Community College at Ronald May Field. LOUISBURG -- After being forced to forfeit six games due to the use of an ineligible player, the Louisburg College men’s soccer team hoped to quickly regain its bearings in the tough Region X standings. Last Wednesday, Louisburg hosted long-time rival Cape Fear and held a one-goal advantage at the break. 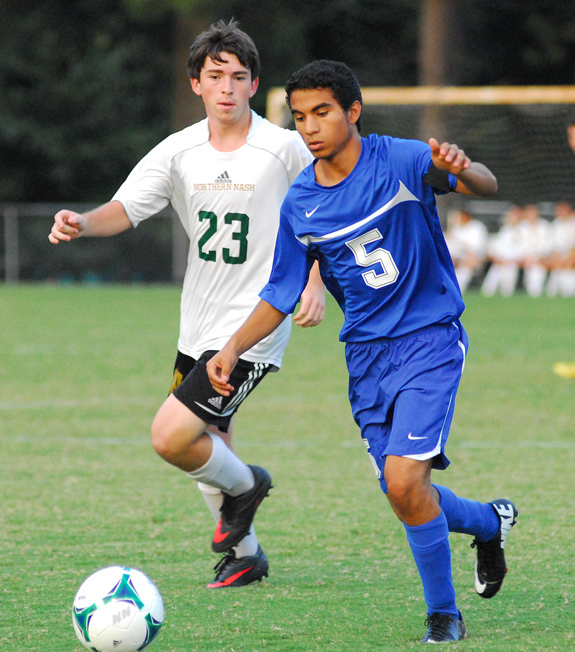 But LC couldn’t hold the cushion and eventually had to settle for a 1-1 tie at Ronald May Field on the LC campus. IT’S YOUR MOVE. Franklinton’s Mikaela Pulley (left) -- along with three Warren County defenders -- waits for Brooke Davis to make a set during Tuesday evening’s Northern Carolina Conference volleyball showdown at the FHS Gymnasium. FRANKLINTON -- The three-way dance for second place in the Northern Carolina Conference features the Franklinton Lady Rams as key players -- along with league foes Southern Vance and Bunn. If the seedings hold through Thursday’s regular season finale, FHS will be tied with SV and BHS for the No. 2 position in the NCC behind South Granville, which has already clinched the conference crown. ALL ABOUT ELEVATION. 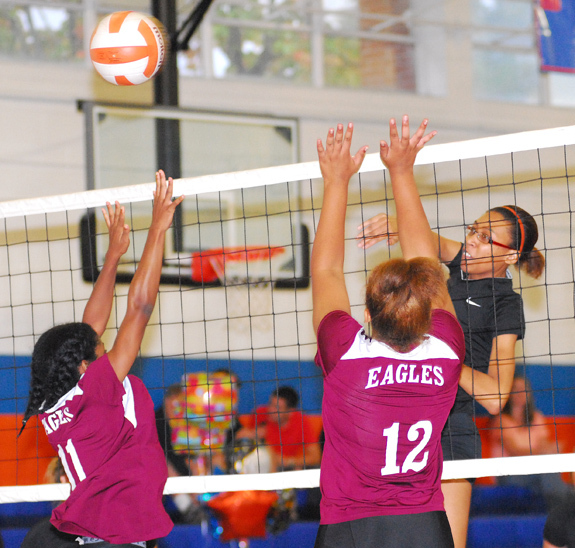 Louisburg’s Vanisha Wilshire (right) rises for a kill during the Lady Warriors’ home spike match Monday against Warren Co.
LOUISBURG -- Senior Night proved to be a one-person show on Monday for the Louisburg High School volleyball squad. As the only upperclassman on a club loaded with freshman, Shardae Alexander had the stage all to herself -- both on and off the court. 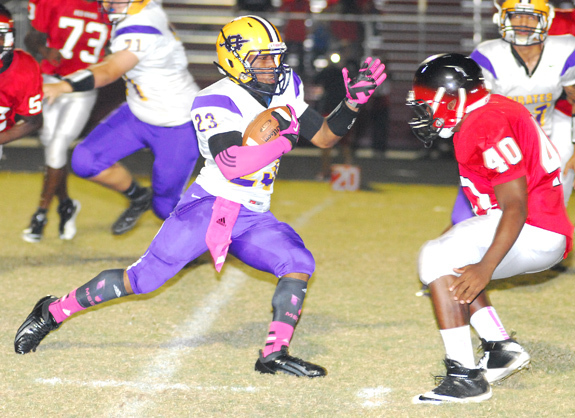 KIPP at Louisburg 7:30 p.m.
Roanoke Rapids at Bunn 7:30 p.m.
Franklinton at Warren County 7:30 p.m.
HEARTBREAK HILL. Franklinton’s Kayla Wetherell makes her way up the hill portion of the course during Tuesday’s meet. 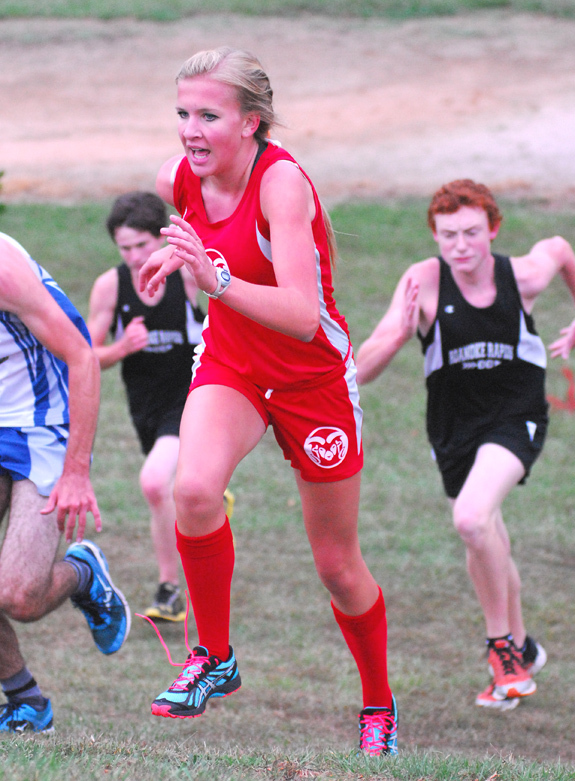 FRANKLINTON -- After six weeks on the road, the Northern Carolina Conference cross country season finally made its way to Franklin County on Tuesday afternoon. That’s when Franklinton hosted the latest installment of the NCC campaign at the Franklinton Recreation Park. The challenging 3.1-mile course is known for its two-time trek over the hill that stands between the softball field and the track at the facility. PURCHASE, N.Y. -- The #17 Louisburg College football team hit its first speed bump of the 2013 season as the Hurricanes lost a Northeast Football Conference (NEFC) game 21-17 to host Monroe College last Saturday afternoon. The Mustangs struck first as they had the only score of the opening quarter. LC cut into the lead as Madison Mills hit John Wheatley on an 8-yard pass play, closing an 11-play, 73-yard possession. WARRENTON -- In the estimation of Coach Chris Lee, the Louisburg Warriors simply couldn’t finish the deal during last Friday’s non-conference road football event at Warren County. Leading by 16 points in the fourth quarter, Louisburg saw the Eagles rally for a trio of touchdowns to pull off a 42-36 decision. KALEB CLAIMS THE BALL. Louisburg High School’s Kaleb Calamaco (right) wins possession during last Thursday evening’s boys road soccer contest against the Northern Nash Knights. RED OAK -- Before traveling to Northern Nash on Thursday for a rematch of an earlier-season match, Louisburg High School boys soccer coach Chris Cannady offered a theme for the event. Cannady wanted his club to not only play harder, but also to focus on team excellence instead of individual performance. MIDDLE GROUND. 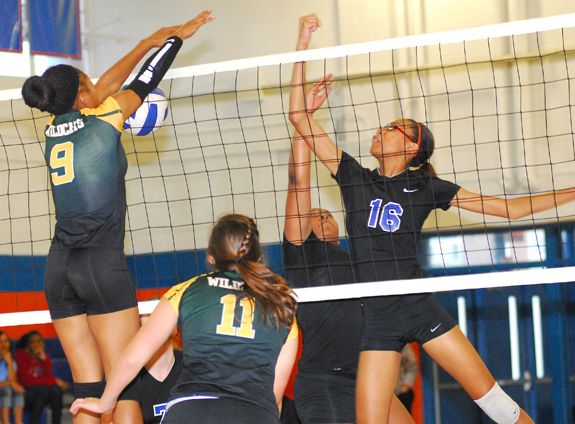 (L to R) Bunn’s Tainasha Vines and Louisburg’s Vanisha Wilshire try to gain the ball last Wednesday. BUNN -- After a brief bump in the road, the Bunn Ladycats are once again speeding toward a strong finish in the competitive Northern Carolina Conference volleyball standings. 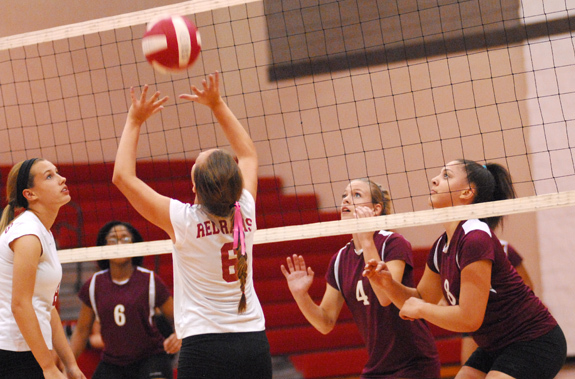 The Ladycats opened their campaign with 13 straight wins, only to slump with four setbacks in a row. Since then, Bunn has embarked on a six-match victory streak, including a doubleheader sweep Tuesday at Roanoke Rapids. BUNN -- Head coach David Howle is voicing the opinion that the Bunn Wildcats couldn’t have picked a better time to enjoy a bye week. Bunn, fresh off a convincing road victory two weeks ago at previously undefeated Northampton County, had a bye last Friday to get prepared for this week’s Northern Carolina Conference football opener at home against Southern Vance. BUNN -- Bunn High School will host a Youth Night as part of Friday’s home football game against Southern Vance. Players and cheerleaders for the Bunn Youth Recreation League and Bunn Middle School are invited to attend the contest free of charge. All youngsters must wear their jerseys or uniforms and meet no later than 7:15 p.m. at the back gate to the BHS Football Field (near the East goalpost). 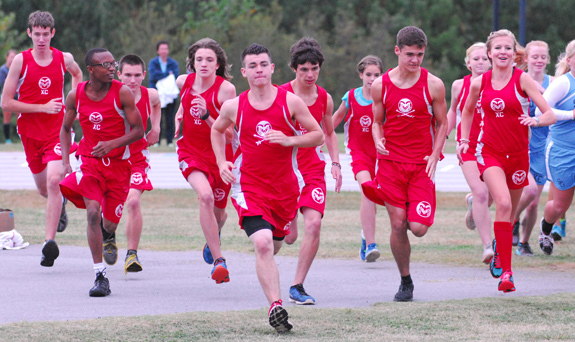 Members of the Franklinton High School cross country squad get off to a strong start during Tuesday’s latest Northern Carolina Conference Meet. The event was held at the Franklinton Recreation Park. Vollmer Farm in Bunn will host next Tuesday’s meeting. 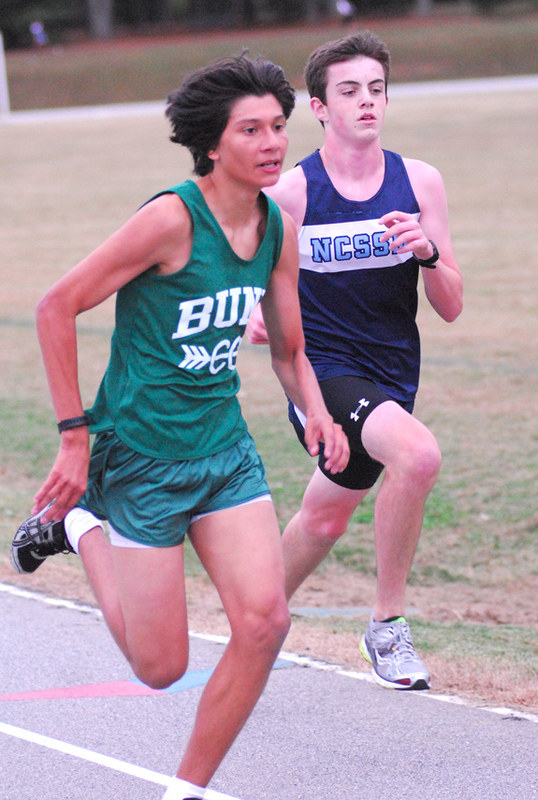 Bunn’s Arturo Torrecilla wins this race to the finish line on Tuesday. Corinth Holders runner Tori Carmichael (left) prepares for a tackle attempt from Franklinton’s Kyrell Wright during last Friday night’s non-conference football meeting at FHS. 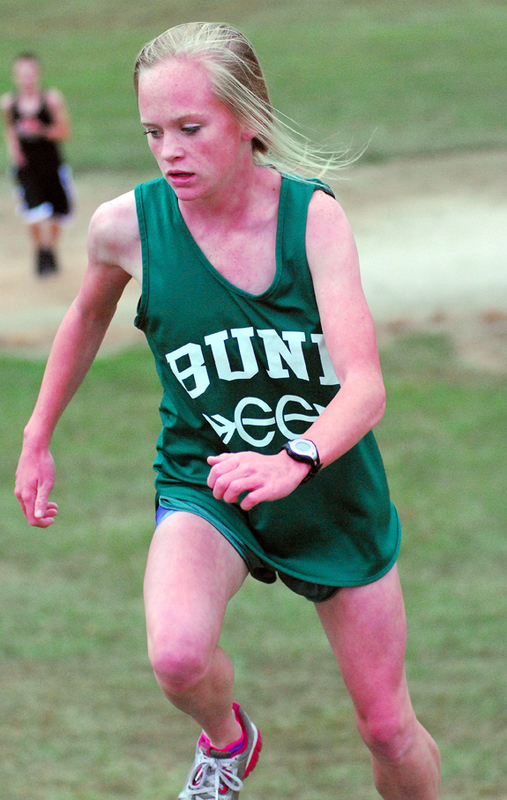 Bunn’s Haley Sheehan took third place in the girls race at Tuesday’s Northern Carolina Conference cross country event at the Franklinton Recreation Park. 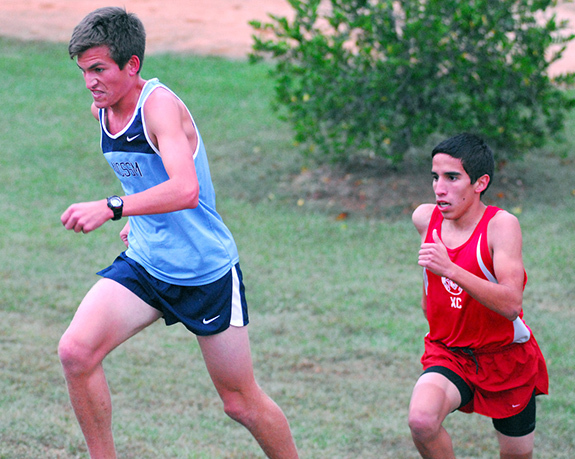 Franklinton’s Luis Guillen (right) tries to overcome a runner from NC School of Science and Math. 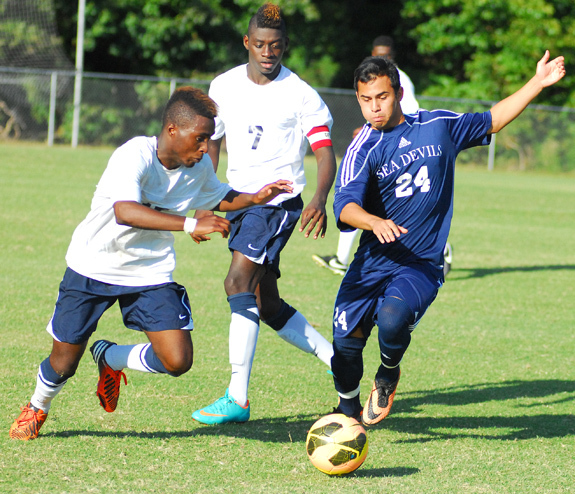 (L to R) Louisburg College’s Justin Burrell and Cape Fear’s Mark Fuentes attempt to gain the ball during last Wednesday’s Region X soccer contest at LC’s Ronald May Field. 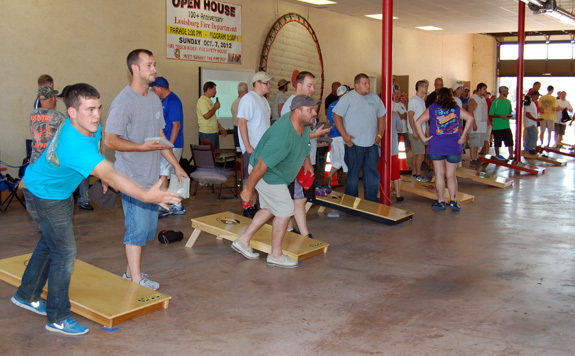 Above, a group of people test their skills at a game of bean bag toss during the Louisburg Fire Department’s Corn Hole Tournament and Open House on Oct. 5. 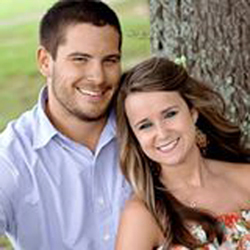 Patty and Robert Skiff of Franklinton announce the engagement of their daughter, Jessica Christine Hayes of Chapel Hill, to Luke Richard Blitchington, also of Chapel Hill. The groom-elect is the son of Diane and Robert Blitchington of Chapel Hill. A September 2014 wedding is planned at the Carolina Inn in Chapel Hill. Personal “Save the Date” announcements will be sent to family members and friends. Dr. Ben Chapman, NC State University Food Safety Specialist, doesn’t miss a beat by showing pictures of a young boy who is now blind because of a food safety issue. Worse, he shows the alarming statistics of those who lose their life every day because food that was eaten was not safe. Believe it or not, the problem is worse than you think. Robert and Janet Fagan of Louisburg proudly announce the birth of their daughter, Lorna Lynn Fagan, born Sept. 12, 2013, at WakeMed in Raleigh. 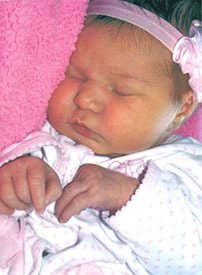 She weighed 8 pounds, 11 ounces and was 20 1/2 inches long. Maternal grandparents are Ronnie and Vicky Griffin of Zebulon. Paternal grandparents are Bobby and Anne Fagan of Louisburg and Lewis and Mary Carowan of Washington, N.C.
BEST OF THE BEST. The Franklin County Firefighters Association named Johnny Hight, (left), and Fred Harris, retiring from the Forestry Service, as 2013 co-Firefighters of the Year. LOUISBURG — Four former employees at a Franklin County assisted living facility are suing its owners, alleging they were fired as retribution for helping social workers investigate allegations that owners exploited residents for financial gain. Attorneys for Hope Benton, the facility’s administrator; Wendy Kinsey, a patient care assistant; Ronnee Klinger, a resident care coordinator; and Dyan Mardlin, a certified nurse assistant, filed the claim in Franklin County Civil Superior Court on Sept. 26. 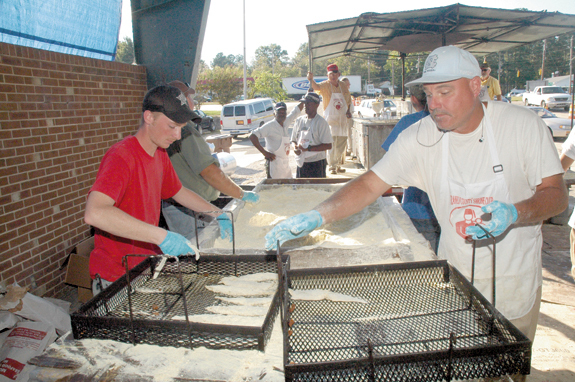 David Denton, left, and Jeff Brown, right, prepared breaded fish for the fryer during the Shriners annual fish fry on Oct. 2 in Louisburg. The event raises money for Shriners hospitals, which help crippled and burned children. Fun, food and music: And all for a cause! For the sixth time, the United Way of Franklin County will be having fun, food and music for a good cause this Saturday. The organization is hosting its annual Cow Chip bingo, along with its relatively new cooking competition — the Siren3 Cook-Off. Franklin County sheriff’s deputies arrested a Franklinton area man on charges of breaking and entering and safecracking. Floyd T. Everette, 26, was arrested on Sept. 30 at the Marathon Gas Station on U.S. 1. He is alleged to have broken into the Olde Liberty Golf Course club house. 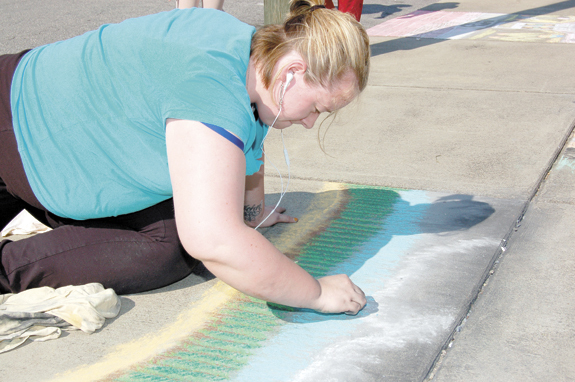 Above, Franklin County Library Director Holt Kornegay is all smiles while Lisa Gaither of Raleigh adds some color to her creation during an Art in the Street event in downtown Louisburg on Saturday hosted by the Franklin County Arts Council. Megan Hunkovic of Wake Forest adds some shading and other flourishes to her artwork. Hunkovic took home an Honorable Mention honor for her Lake Bunn piece of art. 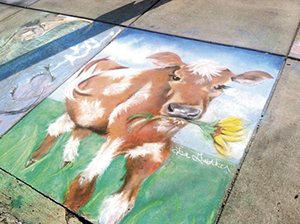 It was Gaither’s Franklin County Cow that took home the Best in Show honor during the event in downtown Louisburg. Franklin County voters are in for some voting changes. Because of that, the county’s Board of Elections has sent out information to help voters navigate the terrain. The Board of Elections will no longer pre-register individuals under 18, unless they will be 18 on or before the day of the next general election. Two Raleigh residents were killed last week following a single-vehicle wreck in Franklinton. According to a report by State Highway Patrolman B.E. Pulliam, Alexandra Davis, 35, was driving a 2006 Kia van south on U.S. 1 near Cheatham Street at about 1:40 p.m. when she ran off the road to the right. The van overturned and hit a utility pole, ejecting both Davis and a passenger, 44-year-old Davis Bradley. The federal government shutdown has caused staff at the county’s USDA office to scramble, a bit. The USDA-NRCS field office is closed because of the budget impasse. The Natural Resources Conservation Service (NRCS), is USDA agency that provides technical assistance to the Franklin Soil and Water Conservation District to help implement its conservation programs. A Louisburg man is slated to appear in court next month on charges that he killed a woman during a traffic accident. According to the State Highway Patrol, Paul Jago, 55, was merging onto I-540 the evening of Oct. 4 when he hit a woman and a car parked on the side of the road. 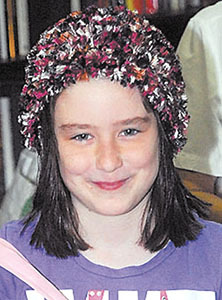 Lauren Gervig died from her injuries. One Man’s Treasure Flea Market Mall celebrated its grand opening on Oct. 5. The shopping outlet is located at 301 E. Nash Street in Louisburg. Store hours are Monday through Saturday, 9 a.m. to 6 p.m. Owners Stan and LeaAnne Hahnel (in front row) were joined by town officials, including Town Administrator Mark Warren (cutting the ribbon), customers and mall vendors. Encore! Encore! 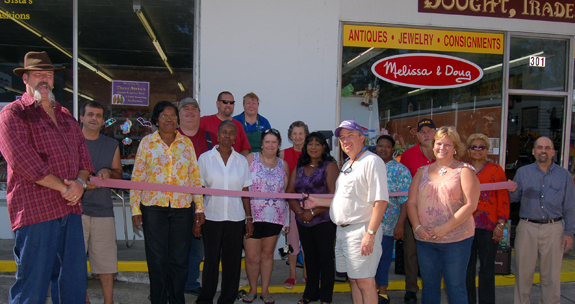 Resale Shoppe held its grand opening this week in downtown Louisburg. Located at 210 East Nash Street, Suite 100, the Encore! Encore! proceeds go to Franklin County Volunteers in Medicine. The store is open Monday through Thursday from 9 a.m. to 5 p.m. and Fridays from 9 a.m. to 6 p.m. Stop by the store for information. 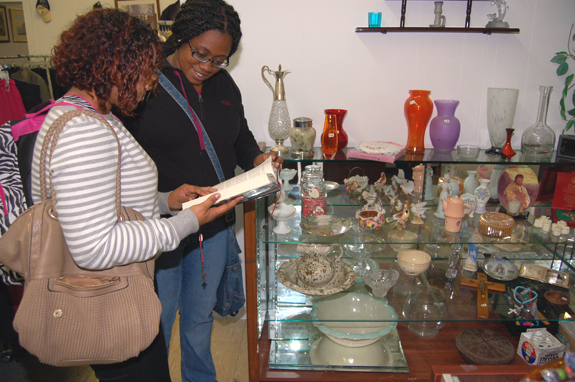 In the photo above, Louisburg College students (left to right) Jenissa Poole and Kyra Brown browse at Louisburg’s newest shop. You may drop off your donated items at the store or Rouse will pick them up on Thursdays.